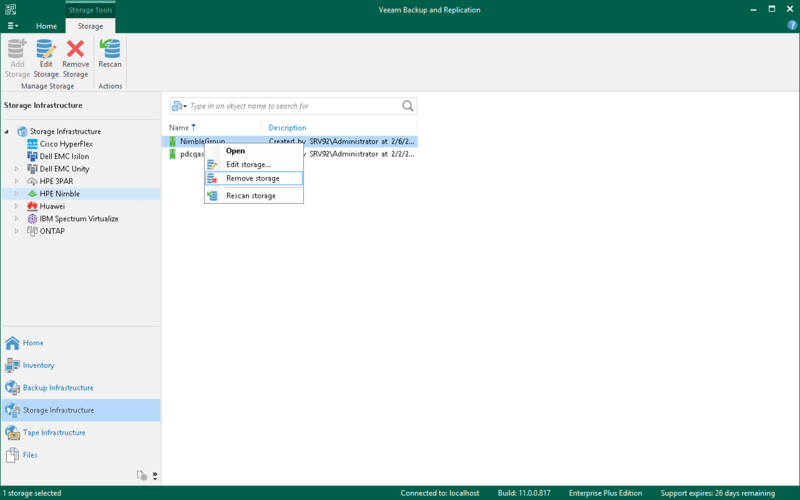 You can remove a storage system from the backup infrastructure, for example, if you do not want to perform Backup from Storage Snapshots or use Veeam Explorer from Storage Snapshots anymore. When you remove a storage system from the backup infrastructure, Veeam Backup & Replication attempts to find hosts with IQN starting with the 'VeeamAUX' prefix and remove such objects from the storage hierarchy. Veeam Backup & Replication assumes that such hosts are created by Veeam Backup & Replication itself and are used for service purposes. You cannot remove a storage system from the backup infrastructure if you have a snapshot job configured for this storage system. You must delete the snapshot job first. In the inventory pane or in the working area, right-click the storage system and select Remove storage.